Justice Secretary Humza Yousaf has today received a briefing by senior Police Scotland officers on how the service is preparing for the upcoming visit of the US President and the protests expected to take place in various locations. 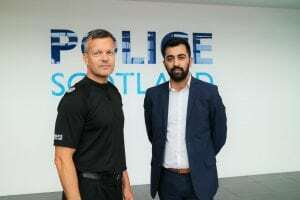 Mr Yousaf has urged those attending any protests this weekend, when President Trump visits Scotland, to do so safely and peacefully. “We understand that many people feel very strongly about President Trump and his administration’s policies, and will want to express that this weekend when he is in the country. “The President’s visit to Scotland will require a significant policing operation, involving thousands of officers and specialist resources. As with the visit of any high profile head of state, detailed planning is already well underway. “Whilst the exact details of his programme are still being finalised, our objectives will be to ensure the safety of the President and of those travelling with him and to maintain public safety. In addition, we will work closely with ‎any groups to facilitate lawful protest.